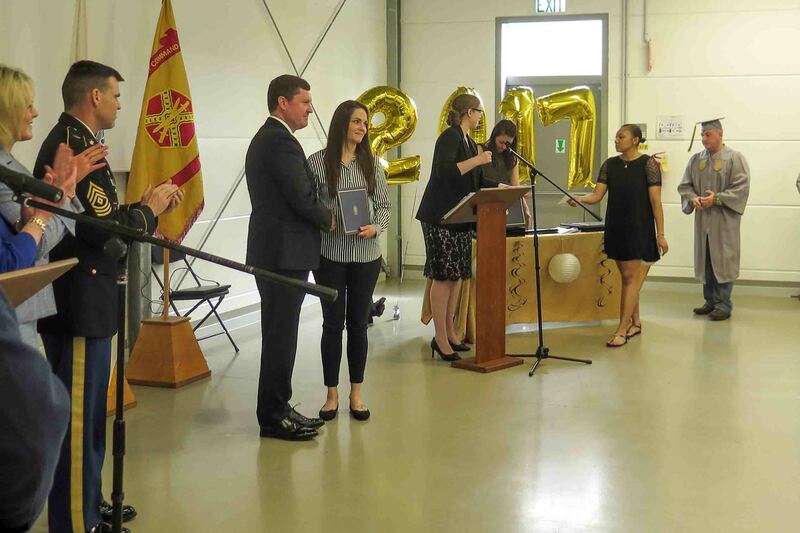 GRAFENWOEHR, Germany — Overcast skies couldn’t dampen the upbeat mood at the 2017 College Graduation Recognition Ceremony May 12 at the Rose Barracks Multi-Purpose Center in Vilseck. Senior Education Services Officer Kathleen Connolly opened the ceremony, which drew the largest number of college graduates in the ceremony’s three-year history. “Adult learners really do make a sacrifice,” Connolly said, pointing to the long hours adults spend pursuing their degree in addition to time spent working in their professions, or taking care of a family. This year, 45 students earned associates, bachelors and masters degrees from three on-post universities, Central Texas College, Embry-Riddle Aeronautical University and University of Maryland University College. In addition, students received degrees from nearly 20 other off-post colleges. Students also came from the Hohenfels and Garmisch communities to attend the ceremony. Many were accompanied by family and friends, some in uniform. Teachers Angelo Aldridge, from Central Texas College, and Dr. Gloria Jones, from University of Maryland University College Europe, were recognized for their service and dedication to students and received the Excellence in Teaching award. The graduates were quick to point to those who had encouraged them on their paths. Jerry Jackson, Jr., a UMUC graduate who received a bachelor’s in Management Studies quickly pointed to his wife, Antoinette. “I feel great, my wife actually motivated me to do it,” Jackson said, smiling. A retired veteran, Jackson said he would like to obtain a master’s degree and maybe eventually a doctorate. Leah Markham already had a master’s degree in business, but decided to change direction, attending Liberty University and obtaining a dual master’s degree in Elementary Education and Special Education. She acknowledged how hard it was, having just finished her student teaching last Friday. Markham suffered a miscarriage after 16 weeks, in the middle of her student teaching, but quickly returned to her studies, wanting to be a good example for her children. Those in attendance included garrison leadership, college representatives and Education Center staff who praised the hard work, determination and focus of the graduates. Rodney Morgan, Retired First Sgt. Sports and Health Sciences, B.S. Elementary Education, Special Education, M.A. Human Development and Family Science, B.S. Procurement and Acquisitions Management, M.A.